Celebrity stylist Misa Stylist Misa Hylton never wanted just a fashion e-commerce business; she wanted a luxury online boutique where shoppers would feel engaged by an experience. Frustrated by her own encounters shopping online, she endeavored to offer her customers rare, "show-stopping" items by little or unknown designers in a clutter-free environment. MadisonStarCouture.com is that place. With items that range from $90 to $1,300, the site offers clothing that changes seasonally and ranges from handbags and belts to dresses, tops, jackets and shoes--all artfully photographed without the use of models or props. "I wanted to provide items that you couldn't find anywhere else and still access the types of clothes that I would typically provide for my clients," Hylton explains. "Celebrities like to start trends, to be refreshing, interesting, and exciting. Everyone knows where to find known designers. I wanted to offer something different." Hylton's talent for finding extraordinary accessories and bold designs has been much of her styling appeal throughout her career since the early '90s. Having worked with a variety of celebrities, including Mary J. Blige, Kimora Lee Simmons, Serena Williams, Queen Latifah, Chris Rock, Missy Elliott, and Diddy, the 32-year-old, has also been credited with inspiring the current high-fashion styling of hip-hop artists. On her site, Hylton is intimately involved in selecting and presenting items to her new and growing cyber clientele. "I do all the shopping," she says. "And I love everything I select. I love detail and accessories and clothing that makes a statement." This fall, Hylton plans to launch a signature denim and T-shirt line. A mother of three, she adores the flexibility of this business--for her and her customers. Hylton can track progress early in the morning before her children awake, after they've gone to school, and in the evenings when they are in bed. She has also received sales orders from as far as Kuwait. "I would not have been able to receive such an international clientele with a boutique in Manhattan," she remarks. "I wouldn't have done it any other way." eFashion Solutions is currently holding open casting calls for Baby Phat Fit Models. If yes, proceed to apply online at BabyPhat.com. Beautiful faces, nice curves, and positive attitudes are strongly encouraged to apply! No experience required. Will the tyranny of Japan’s cutest export ever end? Sanrio brought Hello Kitty to the West in 1976, yet despite endless innovations in other forms of popular culture—Al Gore’s Internet, the radicalization of fondue, the subtle evolution of wide-legged pants—Hello Kitty hasn’t changed. Her oval, wide-set candy eyes sit miles away from her tiny yellow nose. Her moony white head, which teeters on her body, has a balloon-y bow. Her delightful outfits change according to the situation—gardening, instant-soup time. She’s the very essence of adorable. Enthusiasts buy everything Hello Kitty: air purifiers, banana covers, vitamins, tarot cards, bicycles. 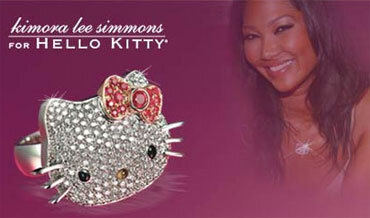 Kimora Lee Simmons’ new Glam Kitty jewelry line has a watch for almost $2,000, and a necklace for $25,000. Urban Outfitters currently offers three Hello Kitty T-shirts, as well as limited-edition Hello Kitty statues. Hello Kitty is a new interface for the video game World of Warcraft, and NEC recently released a black Hello Kitty Swarovski-studded computer with a heart-shaped mouse, so you can palm Kitty’s face while you search online for the latest Kitty product. She’s everywhere. Just like last year. And the year before. Hello Kitty is the “it” girl of cute every day of the week, every week of the month, every month of the year. But why? Is there such a paucity of imagination that we can’t conceive of anything cuter? What was the single most over-the-top item? 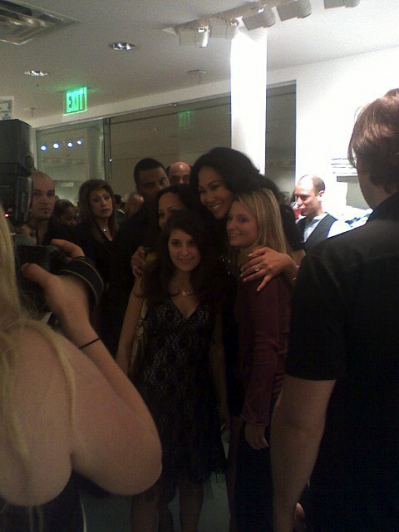 Former model Kimora Lee Simmons adorned her KLS by Kimora Lee Simmons collection with jewelry from Sol Rafael. The most expensive piece, valued at $50 million, had a 50-carat canary diamond on a necklace with 100 white diamonds. "This collection is all about St. Tropez, and what you would be wearing in a typical day there," says Simmons. "The jewelry enhances the collection and adds to the glamour. It's not unrealistic to be wearing six inch heels, a dress and a fantastic piece of jewelry while you are walking around. Art is imitating life… well, imitating my life!" But how about the lives of her customers? Can a designer stray so far into fantasy that he or she loses touch with buyers? Or to put it another way, can a collection ever go too far over the top? "Sure," says Gruber. "There is always that risk. But there is no formula for success in fashion, especially when you are displaying artistry and unconventional designs. Sometimes [taking risks] just has to outweigh functionality." WWD.com - The glitz and glam of Saint-Tropez was the main source of inspiration for both the makeup and hair at the Baby Phat show. “The look is about opulent women coming out of a boat or yacht in Saint-Tropez and it’s taken from her own life,” said Laurent Philippon of Bumble and bumble. “It’s that hair that’s way too big and too much makeup.” Philippon looked to create a natural wave that had loads of volume and looked clean. For makeup, Lisa Butler for MAC Cosmetics said the look was inspired by a combination of Barbie together with television show “Dynasty.” After applying Studio Stick Foundation and Mineralize Skinfinish Natural Powder, she used a combination of Rhubarb and Apple Cheeks shades on the cheeks as well as the eye. Also on the eyes, Butler used a blend of Rhubarb, Kitchmas and Copper Sparkle pigment. To top off the look, she coated hot-pink lipstick with clear lip gloss.